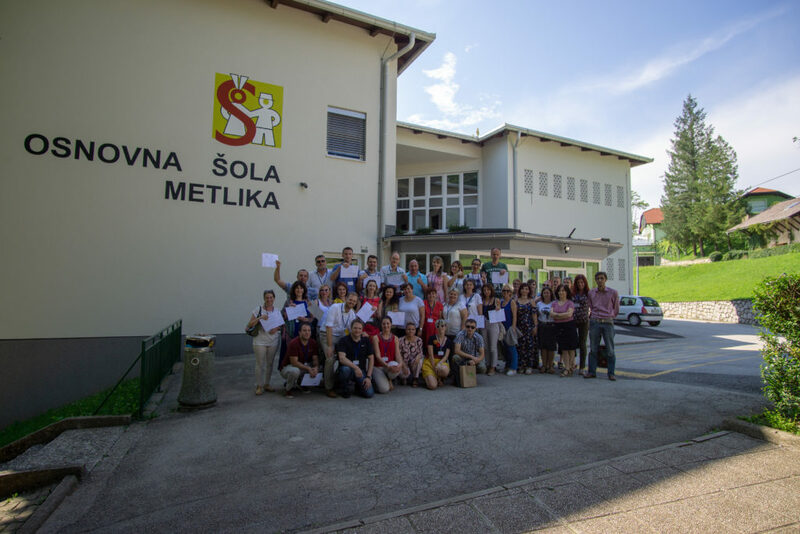 Last week, the final combined training for the project Strategies for Inclusion took place in Metlika, Slovenia, from the 9th to the 15th of July 2018. The meeting was organised by EUROCLIO, by the Slovenian History Teachers’ Association, and by Zavod za gluhe in ngalusne Ljubliana, one of the partners in the project. It was realised with the support of the Erasmus+ programme of the European Union, and it was attended by representatives of the partners in the project, as well as by the trainers and by the members of the Special Interest Groups on Motivation and Learner Variability, and on Blind and Partially Sighted and Deaf and Hard-of-Hearing. In addition to that, the meeting incorporated the fourth Regional Summer School. Because of this incorporation of the Regional Summer School into the project training, EUROCLIO was able to fund the participation of representatives from HTA’s from Southeast Europe. In addition, four educators were selected through an open call to participate in the training. In total, the training was attended by 55 participants, from a total of 23 different countries. The mix of Special Interest Group members and other educators which were rather new to the topic of inclusive education caused interesting discussions and provided learning opportunities for everyone. All the participants, at the end of the training, recognized an increased awareness of what determines high quality and inclusive history and citizenship education, gained thanks to the sharing of experiences, practices, and resources throughout the training. The meeting consisted of five full working days with different programme elements, and was the perfect opportunity for EUROCLIO, the Special Interest Group members, and the Partners, to discuss and show what has been done throughout the development of the project. The project, in fact, which included the development of five different outputs: a Selection of Existing Resources and Recommendations, a Needs Assessment, a Collection of Practices, the creation of Educational Resources, and the production of Policy Recommendations, which will soon be shared on the EUROCLIO website. All such outputs fed into the rich programme of the training. The programme included plenary sessions and workshops on various aspects of inclusive education, group discussions on challenges to inclusive education and possible, concrete solutions, a demonstration of Historiana, using the resources available on Europeana, and workshops using 9 of the 19 educational resources that have been developed, which will be shared on Historiana. During the training, various speakers intervened, such as Dr. Carrie Weston (University of East London), Steve Johnson (Cambridge Assessment), Arie Wilschut (Amsterdam University of Applied Sciences), Lise Kvande, together with three of her students from the Norwegian University of Science and Technology, and Jayne Pletser (International Baccalaureate). The programme of the meeting included also two Regional Workshops, hosted by Donika Xhemajli and Zvezdana Petrovic. In addition, a cultural programme was offered about the inclusion of Uskoki minorities in ancient Slovenia, followed by a lecture from the local historian Janez Weiss. 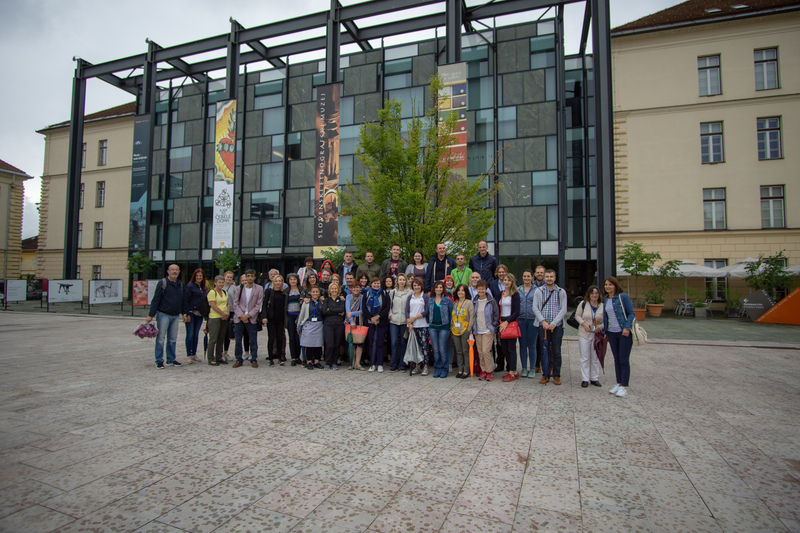 Educators took also part in a visit to to the Slovene Ethnograhpic Museum in Ljubljana, and to the Elementary School Milke Šobar- Nataše, which offers curricula specifically designed for students with Special Education Needs. At the end of the training, Special Interest Group members seized the opportunity to highlight the momentum gained by the project and by their now three years-experience in barriers to inclusive education, in the design of educational resources tackling such barriers. They expressed the desire to continue to work on the topic, sharing their practices and experience with other teachers throughout, and beyond, Europe.